Davis Dance Project 2016 – Improvisation and Choreography: Two Tools that Dancers Use. What’s the difference and how can you know? We’ll answer your questions when you come to the show! Most people understand the concept of Choreography. At its simplest, choreography is an arrangement of dance movements that are memorized and so can be repeated. It is a very specific structure of steps that need to be done in a certain order, with specific timing. For those of you who might not be dancers, here’s an example: The alphabet song… how many of you can sing it, right now, without looking it up? Or the Pledge of Allegiance? Both of these are a memorized set of words or sounds which have meaning and a specific order. If you change the order some of the meaning gets lost and it’s more difficult to remember and make sure that you have listed all the important parts of the message. But, if you have memorized them and practiced them repeatedly, you can recall them at later times without too much effort. In dancing, each of the steps or movements are part of what we could call “movement vocabulary”. Dancers don’t need to think up anything new during performance. Dancers have a chance to practice the sequence of movement and perfect their performance of the steps. In a dance with two or more people, all of the dancers know what to expect. It is possible to create unified looking pieces even if the dancers can’t see each other… maybe even if they were blindfolded! The intent or purpose behind the choreographic choices is controlled by a specific artistic vision and won’t be changed during the performance. 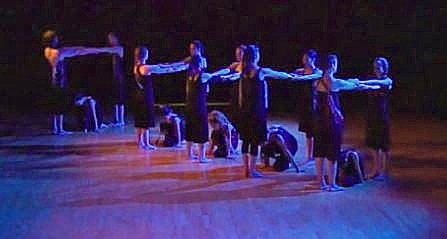 The dancers’ transitional (traveling) movements are set ahead of time, so using the stage space well, from the audience perspective, is planned in advance. Memorization of long sequences of movement. Doing the movements in the same way as all of the other dancers. Counting or interpreting the music in the same way as all the other dancers are counting or interpreting the music. When you’ve forgotten a set of steps, and you’re in front, and can’t see what everyone else is doing! When you’re working with others who have forgotten a section of choreography, and you aren’t sure how to “fix” it, because there’s an audience and no opportunity to stop and re-do it. The truth is that most dancers love choreography… They have trained their brains (and their muscles) to memorize long movement sequences. Once they know the steps, they can simply enjoy moving to the music… taking the steps of the choreographer and creating a work of art through their interpretation of the movement and music. And yes, most dancers have experienced the moment when suddenly their brain is totally blank but, if they have danced long enough, they have learned how to improvise. Coming up next… Improvisation and the art of creative problem solving!